Model 242 transfer case is a chain-driven, 2-piece aluminum case, with full time operation. Torque input in 4WD high and low range is undifferentiated. Remove shift boot and shift to 4L position. Loosen trunnion nut. Adjust trunnion and shift rod until rod fits freely. Tighten trunnion nut and remove shim. Check fluid level. Ensure correct fluid is used. If fluid is okay, locate noise and check for possible internal mechanical problem. Transfer case not completely in gear; check shift linkage. Range fork damaged. Inserts are worn. Shift fork binding on shift rail. Low range gear worn or damaged. Transfer Case Will Not Shift Through High Lock Range Incomplete shift due to driveline torque load; momentarily release accelerator pedal to complete shift. Check tire pressure and tire wear. Vehicle overloaded; remove load and check shifting. NOTE: When replacing oil seal, DO NOT remove extension housing. housing. Reverse removal procedure to complete installation. Shift transfer case into Neutral position and drain fluid. jack. Separate transfer case from transmission. Remove transfer case. To install, reverse removal procedure. Tighten bolts to specification. See TORQUE SPECIFICATIONS. Adjust shift linkage, if necessary. companion flange, washer and seal. Place transfer case in 4L position. screwdriver. DO NOT damage mating surfaces. NOTE: DO NOT disassemble oil pump, replace as unit only. Remove oil pump, pick-up tube and screen from rear case. is aligned with hole. Remove lock pin with No. 1 screw extractor. intermediate clutch shaft snap ring from mainshaft. washers from mainshaft. Remove low range fork and hub. Remove shift sector. Remove shift sector bushing and "O"
ring. Remove front bearing retainer. Remove input gear snap ring. gear bearing. Remove low range gear snap ring. Remove input gear retainer, thrust washers and input gear. differential halves. Remove planetary gear and thrust washers. front bearing. Using a press, remove input gear bearing. Fig. 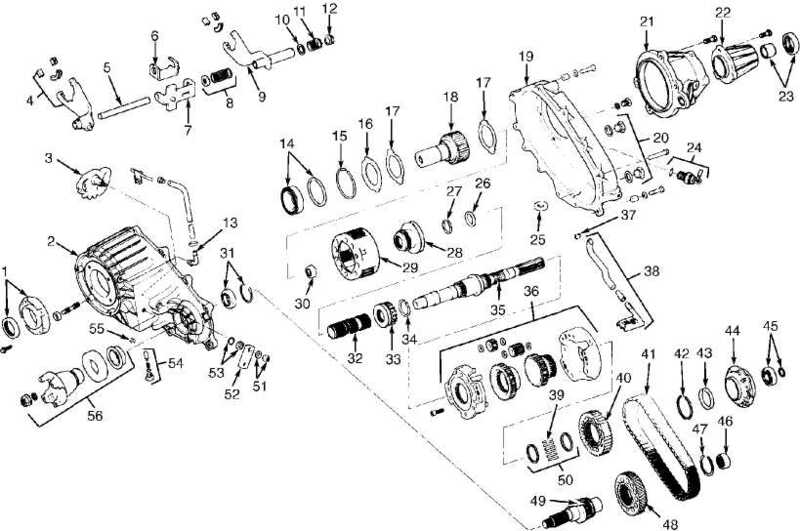 1: Exploded View Of Model 242 Transfer Case Courtesy of Chrysler Motors. Clean all parts with solvent. Dry with compressed air. pump as an assembly if any part is damaged or worn. block and press, install input gear until snap ring is against case. ring. Ensure snap ring is seated properly in groove. Start input gear shaft through the bearing in front case. adapter is positioned properly before pressing shaft. NOTE: Ensure proper size tool is used to press input gear shaft; wrong size tool can damage case and thrust washers and will move pilot bearing too far into gear bore. lower differential case. Install bolts and tighten to specifications. See TORQUE SPECIFICATIONS. Install needle bearing spacer on mainshaft. all needle bearings are in place. Install differential snap ring. ring. Install mode shift sleeve in mode fork. engage mainshaft with low range components. snap ring. Install front output shaft rear bearing. "O" ring in oil pump. Install oil pick-up tube and screen. Ensure screen is properly positioned. See Fig. 2.
sealant to front case mating surface. Assemble case halves together. oil pump inner gear and a washer is used on bolts at dowel locations. Install rear retainer bearing in retainer. Apply 1/8"
Fig. 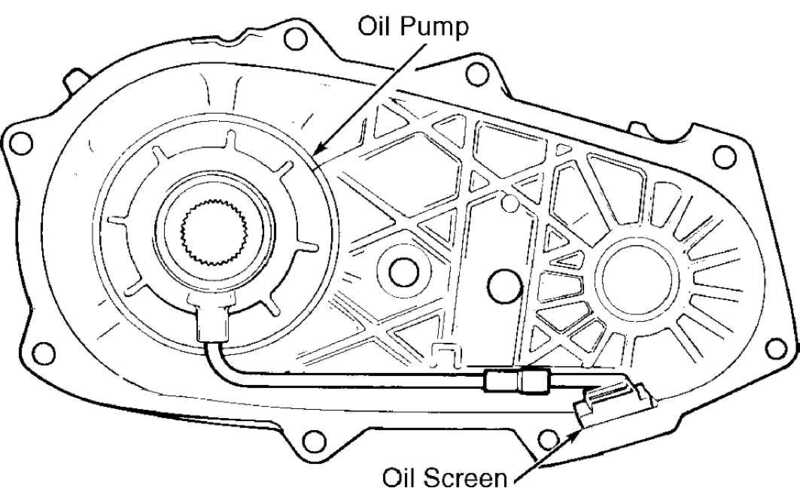 2: Identifying Oil Pump Screen Position Courtesy of Chrysler Motors.